A few weeks ago, I ordered some yarn, 3 skeins from Morning Bright Yarn in Maine. 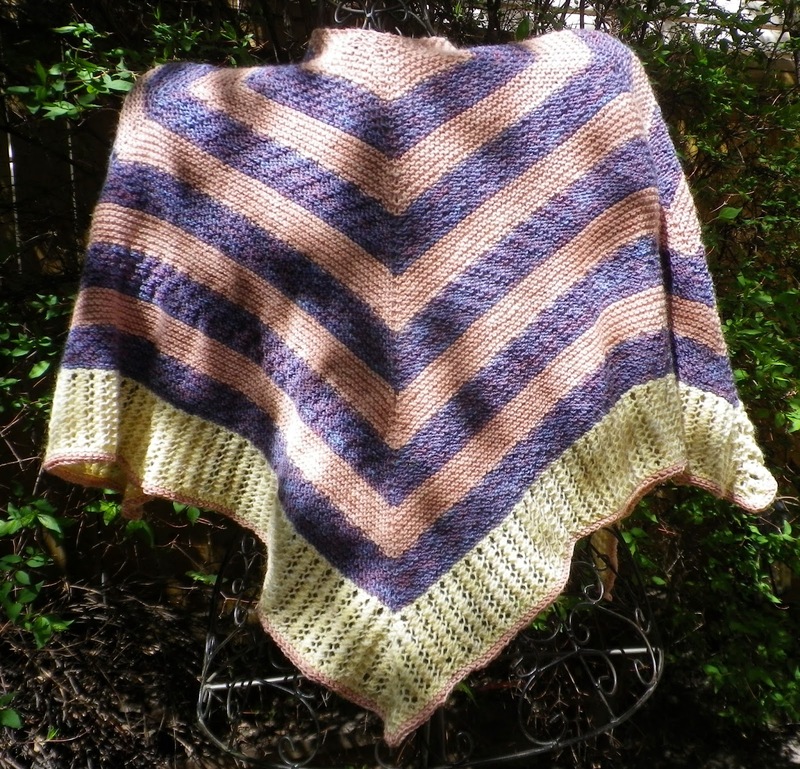 Becky Foster, the yarn dyer, is also a knitter on Ravelry, who had knit my pattern River Shannon. When the yarn arrived, there was a note inside the bag saying the 3 colours I chose coordinated nicely together. If that was a hint, I took it, and started imagining what those three skeins of yarn could turn into. Three skeins are plenty of yarn to make a large shawl. I wanted a large one, after all the small ones I have knit this spring. 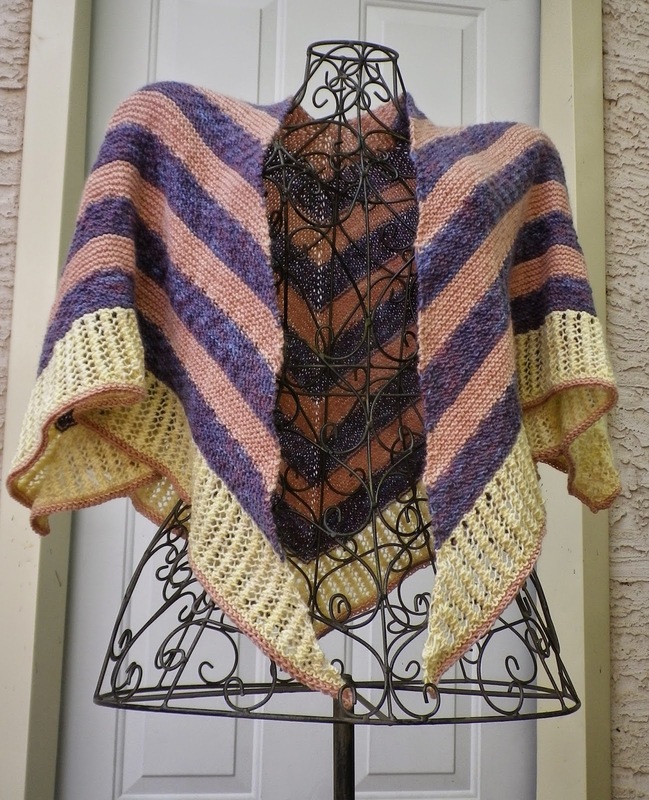 A square shawl drapes nicely, and has plenty of material to cover your arms. If you are cold, you want your arms covered, not just your shoulders. If you are cold, you don't want a lot of big lacey holes either. If you are using 3 different colours, you probably are going to have stripes. If you are lazy, like me, you want some quick and easy knitting with rows of garter stitch thrown into the mix. 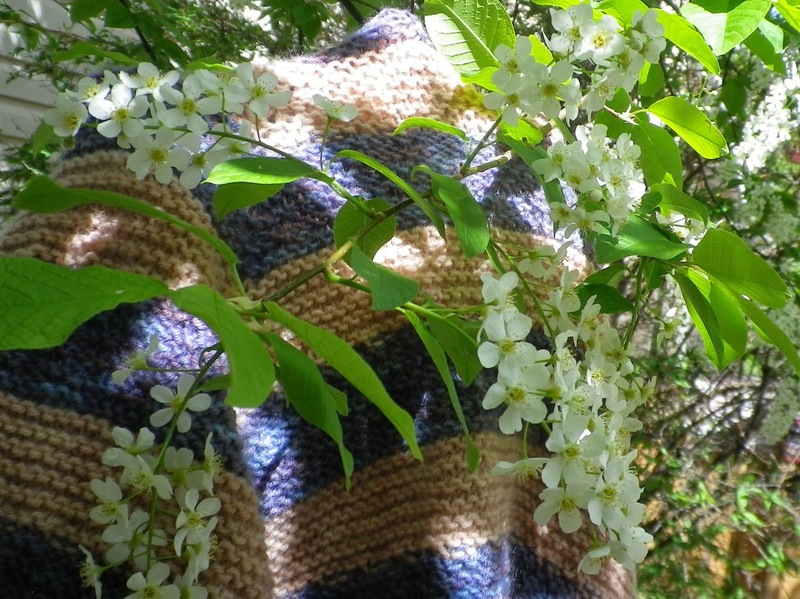 I did not have a name for this shawl yet. Names usually come easily to me, and I tried several that, although were interesting, didn't stick. 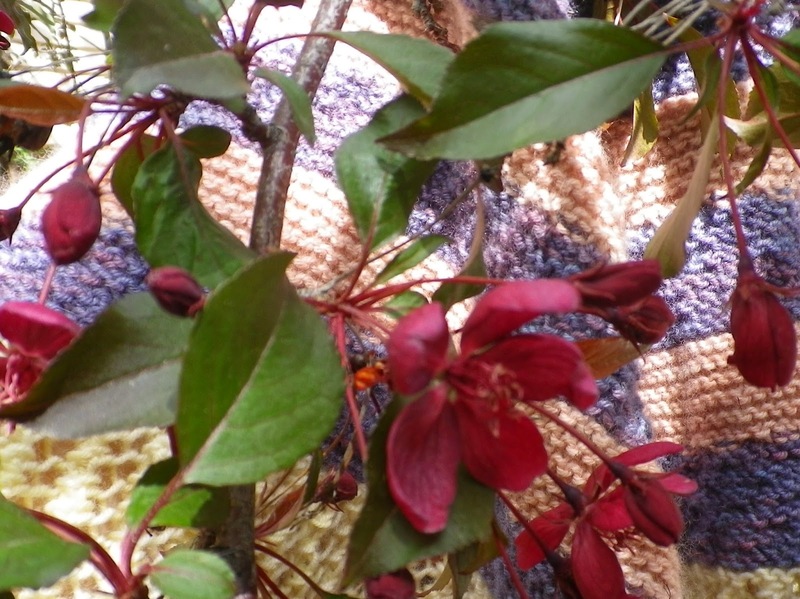 Finally, I looked to the names of the colours of the yarn; Wild Plum, Cider, and Aspen. Ah ha! Could there be a more clear sign than that? TREES. The next step was to do a bit of research into some Tree Goddesses, and that lead me to Rafu-Sen. HER NAME MEANS BUOYANT SUBTLETY, SHE REPRESENTS THE CYCLICAL RENEWAL OF SPRING AND IS USUALLY DEPICTED AS A BEAUTIFUL YOUNG MAIDEN. SHE WANDERS ” THROUGH FRAGRANT GROVES OF BLOSSOMING PLUM TREES AT NIGHT, ESPECIALLY IN THE MOONLIGHT. ACCORDING TO AN OLD JAPANESE LEGEND, A YOUNG MAN BECAME VERY COLD WHILE WALKING “MOUNT LOFU. ” HE STOPPED AT A WINE SHOP TO WARM HIMSELF, AND IN THERE, HE MET A LOVELY YOUNG WOMAN IN A WHITE GOWN WITH WHOM HE DRANK SEVERAL CUPS OF PLUM WINE. EVENTUALLY, HE PASSED OUT, AND WHEN HE WAS AWAKENED BY A COLD DAWN WIND, HE FOUND HIMSELF LYING UNDER A PLUM TREE. HE KNEW THEN THAT IT WAS THE GODDESS HERSELF WHO HAD SAVED HIS LIFE. “RAFU-SEN” STANDS FOR THE PLUM BLOSSOM, SYMBOL OF SPRING AND BRAVERY, FOR THE PLUM TREE BLOOMS WHILE THE SNOW IS STILL ON THE GROUND. 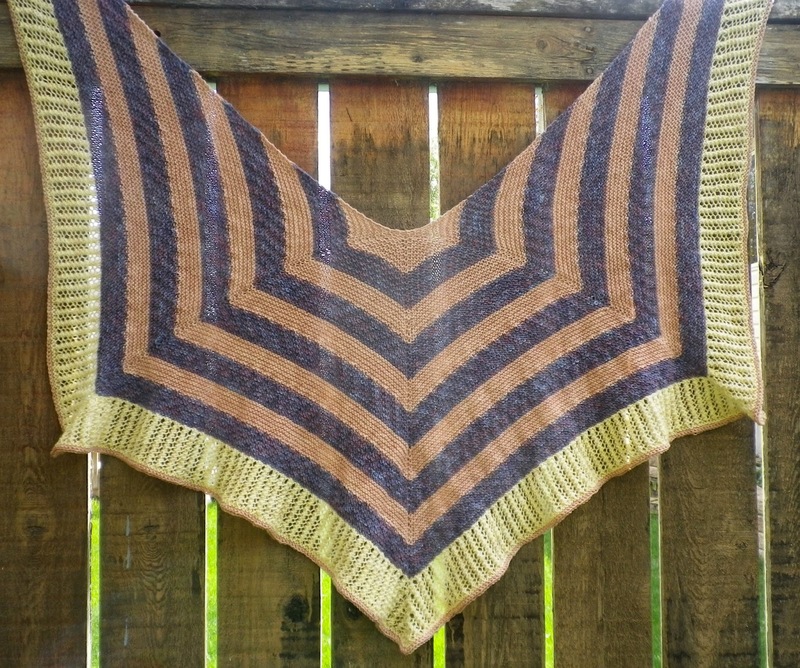 So, Rafu-Sen is a perfect name, I think, for my latest shawl pattern. Now I need some test knitters so I can find all the little 'boo boos' in the pattern. After that, probably by the middle of July, the pattern will be released. 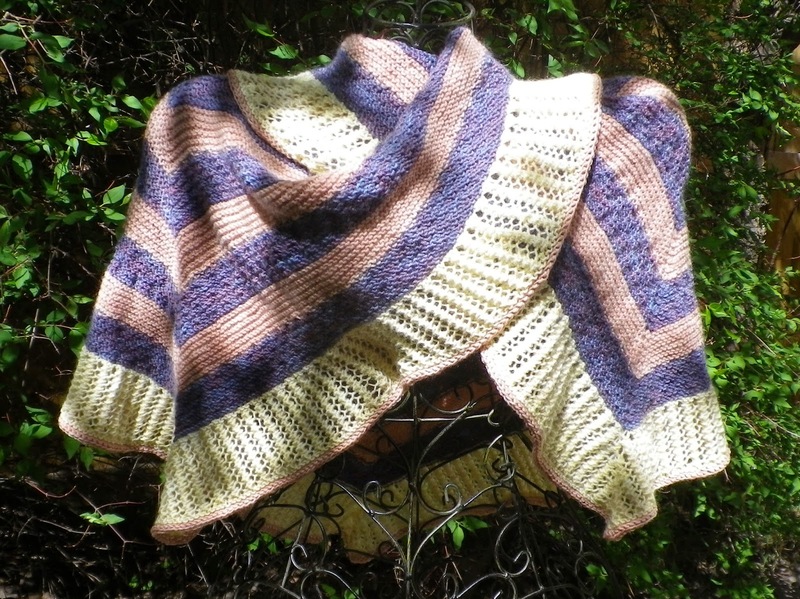 Oh, and here is the nicest surprise of all: Becky of Morning Bright Yarns is offering a 10% discount to the official pattern testers of Rafu-Sen. I am delighted! This picture, in front of the door to the garage, in my back yard shows the colours the best. Aren't they pretty? The background for these shots is a Waterton Mock Orange shrub. It isn't in bloom yet, but when it does bloom, it has the most incredible scent. I cannot wait for it. It has tiny white flowers. 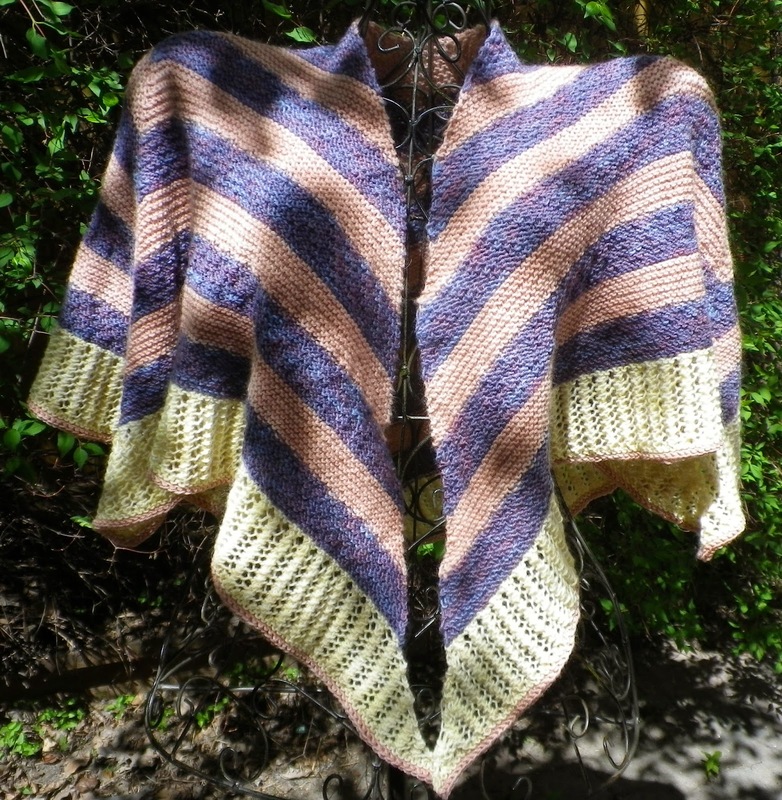 This shawl is really pretty. Thanks Jackie! I like how it turned out. The pattern testing info is here http://www.ravelry.com/discuss/free-pattern-testers/2936555/1-25 and in another a few weeks it will be ready to release.